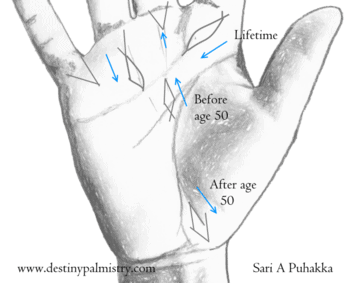 A fish sign on the palm is an oblong circle with a pointed end. It can also look like two triangles with overlapping lines. Sometimes there is a whorl or a dot which forms the eye of the fish. I do not usually read symbols like the fish on the hand. It is very much Indian palmistry lore. However, because apparently, I have some on my palms, I think it’s worth mentioning for the benefit of those who still want to believe in its symbolism. Direction and location of the fish sign? The meaning can vary depending on which way the fish is facing, and on which mount it lies. On the mount of Jupiter beneath the index finger, it suggests power, honour, and respect. Some regard the fish sign on the Jupiter mount as an indication of wealth, especially if the mount is well-developed. It shows leadership, a pleasant, generous and spiritual or religious person. If the fish sign is at the end of the life line on the dominant hand, it ensures remarkable prosperity during life. By prosperity, I mean a sense of accomplishment in what they have achieved. Not necessarily a monetary achievement but a feeling of worthwhile efforts. For a man, it’s said to show an enormous success. In Indian palmistry, a fish sign on a woman’s hand is very auspicious, suggesting she will have good fortune. She will have children and a caring partner or husband that will outlive her. In India, it is considered bad luck for a female to be a widow, especially if she is still young. If the woman is a housewife, it suggests that the husband will be very successful financially. The fish can be found anywhere on the hand. If the mark happens to have an eye, even better. When the fish has the head towards the wrist, prosperity is after the age of around fifty. If the head points towards the fingers, the success will be earlier. If towards the side, throughout the whole life. The Chinese fish sign looks more like open-ended triangles. These lines are supposed to represent a serene life; a spiritual person who loves peace on earth. They know and understand the truth; they will know if you are not being honest to them. They might also have premonitions. If the tail end crosses a finger, it indicates money. Don’t miss out on any articles, come back every week for more or subscribe to our newsletter.